Three Rivers Camp is part of the esteemed Kafunta Safaris collection. It consists of 5 tents and communal areas set near the confluence of the Luangwa, Kapamba and Lusangazi rivers in the Luangwa Valley. The camp faces a lagoon which attracts a variety of animals and birds, and borders South Luangwa National Park. This is prime walking safari territory, with game drives also available, adding up to a comprehensive safari experience in a remote and unspolit area. The large tents ares are decorated in muted tones, with local artworks and patterned textiles adding colour and charater. The large gauze windows bring the outdoors in and let you enjoy far-ranging views from your room. Curtains can be pulled across at night, giving a cosy feel. Each tent has an en-suite bathroom with his and hers basins, a flush toilet, indoor and outdoor shower. The bedroom leads out to a wide raised deck facing the lagoon, ideal for relaxing between activities. There are daybeds, too, which can be used for sleeping out under the stars. The dining and sitting area is the social focal point, where you rest between activities and share meals with fellow guests while watching wildlife by the water. The day at Three Rivers Camp usually ends round the campfire, star gazing and listening to the sounds of nature around you. Open: Three Rivers Camp is a seasonal camp, open from 25th May to 1st November. The camp first opened on May 28th 2017. Location: The camp is in the Luangwa Valley, in the South Luangwa National Park, at the meeting point of the Luangwa, Luzangazi and Kapamba rivers, hence its name. It is about 8kms upriver from Kafunta’s Island Bush Camp and about a 2 hour drive from Kafunta River Lodge. Rooms: There are 5 guest tents, all with a large bedroom, sitting area, private deck with a table and chairs and a platform with day beds that can become star beds for a night in the bush. Each tent has an en-suite bathroom with two hand basins, flush toilet, a bath and shower plus an outdoor shower. Water is heated by solar power. Mosquito nets are provided. Activities: Walking safaris are the main activity, taking place in the area around the camp and by the rivers. You can walk from here to Island Bush Camp to link stays at both camps. Game drives are also offered, with night drives possible. Facilities: The main tent is an open plan lounge-dining-bar area with easy chairs and views out onto the lagoons. There is a campfire. The camp provides a free laundry service. Dining: Meals are eaten as group at the large dining table, hosted by the camp managers. Most are served out in the open, though there is an indoor dining area. On a typical day you will be served a light breakfast at dawn, with brunch on your return from the morning safari. You have afternoon tea before the late safari and then dinner at around 8pm. Children: Children aged 12 and upwards are welcome. Notes: Three Rivers Camp is owned and run by Kafunta Safaris. 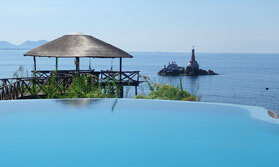 Safari in Zambia's superb South Luangwa then relax on an uninhabited island in Lake Malawi. "You have a real star in TJ - he's a force of nature or really makes this camp such a fabulous experience. We actually preferred it to Kafunta because it's more intimate and feels closer to nature. Great tents - loved the outdoor shower and the star beds." "The camp manager, TJ, is a force of nature and adds greatly to the experience. I thoroughly enjoyed his company in the evenings. If anything, the accomodation is even better than Kafunte and you certainly feel close to nature. I also really enjoyed the communal dining. The highlight of the holiday for me. " "Manager, TJ, was superb, he saw us off each day and was always there to welcome us back. He ate with us and made us feel safe when there were elephants in camp. He engaged with our questions and did a slow motion photoshoot of the sunset for me. When we changed arrangements, he was responsive. We loved the sky bed and outdoor shower in our room too. Note that only 2 of the rooms overlook the river but we overlooked the bush and enjoyed that."